Back from a few days off - Rose and I helped Kamilah moved in to her new apartment over the weekend. I put up some of my art photos to decorate her place. What it now needs is Christmas spirit - so I'm thinking maybe assemble that old plastic tree from some years ago and embellish it with ornaments. 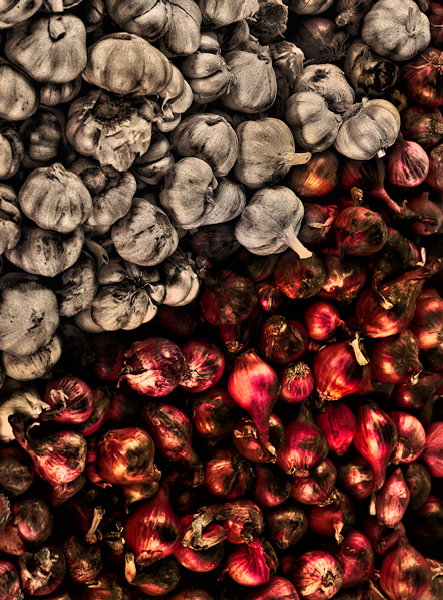 Since I couldn't find enough decors, I'm thinking that I'll use the red shallots and white garlic that I found at the local farmer's market. After all, we are suppose to promote environment-friendly alternatives. Do you think that would work?